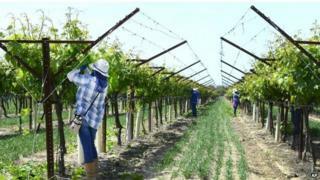 China has become the second-largest vineyard area in the world after Spain, pushing France into third place. The International Organisation of Vine and Wine (IOVW) said China now had 799,000 hectares (1.97 million acres) of land devoted to vineyards. That compared with 1.02 million hectares in Spain. Experts pointed out that not all of China's vineyard area is devoting to making wine - some of it is used for growing table grapes and dried fruit. China has rapidly emerged as a major player in viniculture, accounting for 11% of the territory given over to vineyards last year, up from 4% in 2000. France remained the biggest producer of wine, producing 46.7 million hectolitres (Mhl). It also made the most from selling wine abroad, bringing in more than €7.7bn. The United States remains the biggest consumer of wine, drinking 30.7Mhl - 13% of all global wine produced last year - followed by France and Italy. The biggest importers of wine were Germany, the UK and the US with total global trade valued at €26bn, the IOVW added. Correction 28 April 2015: This report has been amended to clarify that China is not the second largest wine-growing area, but second because of the size of its vineyard area.